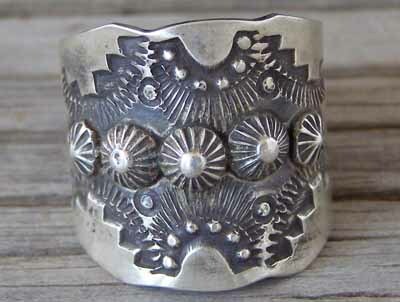 This cigar band ring by Vince Platero relies on his well-known style of stampwork and oxidized Sterling silver further decorated by textured relief, in this case starred buttons. Pair this with one of his pendants or with a pair of his earrings. Hallmarked VINCENT over an arrow with USA stamped below the arrow. Also stamped STERLING inside.